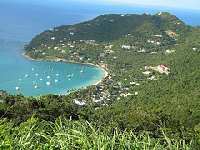 Tortola's main attractions are its pristine white beaches, which provide the perfect setting for swimming, snorkeling, sunbathing, and occasionally surfing in the perennially warm waters of the Caribbean. Popular beaches like Cane Garden Bay, Lambert Bay, Trellis Bay and Long Bay are all good locations for relaxation and watersports. Scuba divers only need to go 6 miles (10km) off the island to reach the Chikuzen, a wrecked Japanese refrigeration ship covered in extensive coral that offers some of the best underwater photography opportunities in the world. Other good dive sites in Tortola include Smuggler's Cove and Brewer's Bay Pinnacle. If you can drag yourself off the beach, sightseeing in Tortola can be rewarding, as there are a few interesting ruins and cultural sites that hint at its colourful past. You can view the ruins of the St. Philips Church, the grand William Thornton Estate, and the remains of a fort known now simply as 'the Dungeon'. Road Town has a number of markets and museums, including the Virgin Islands Folk Museum and the HMS Prison. It's also the centre of Tortola's nightlife, with a variety of restaurants, cafes, bars and clubs. We are looking for contributors for our Tortola travel guide. If you are a local, a regular traveller to Tortola or a travel professional with time to contribute and answer occasional forum questions, please contact us.